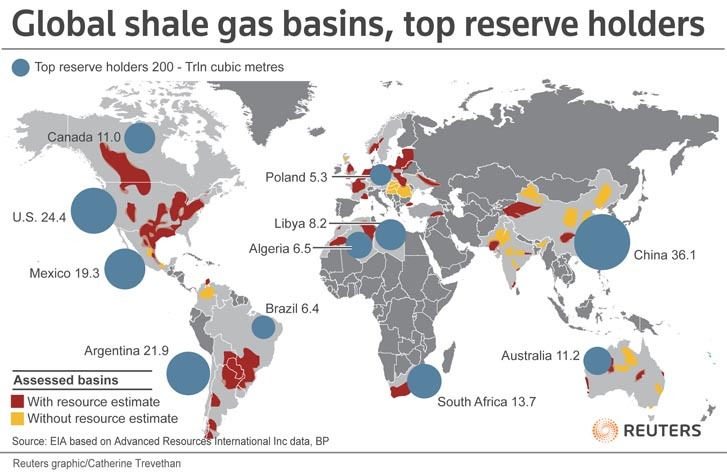 Data point to a handful of hotspots of shale gas reserves across the globe. We’ve explored the developments in other necks of the woods, from China, Argentina, and South Africa – who seem close to meaningful shale production – to Poland and Russia – who perhaps have farther to go to achieve measurable shale success. But now let’s ask: Are others ready to join the race? As it turns out, Mexico, Colombia, and India appear to be pursuing their own shale projects. 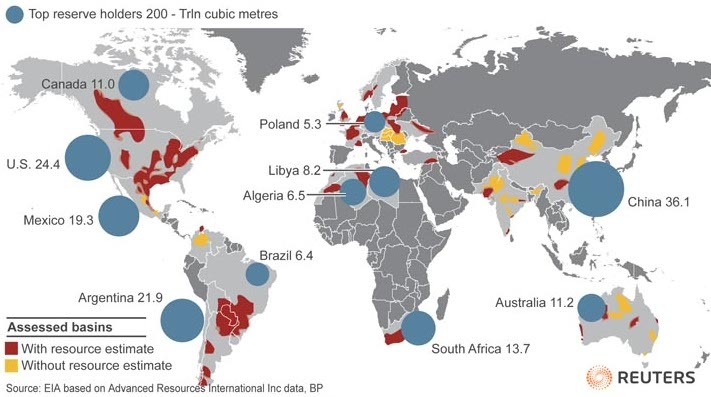 But like individual shale plays, each of these countries faces its own unique hurdles. The viability of their lofty aspirations remains to be seen. Mexico has rich hydrocarbon resources: The US Energy Administration names it host of the sixth largest shale reserves in the world. And proximity to the US could prove benefit Mexico’s shale aspirations – when oil prices rebound. 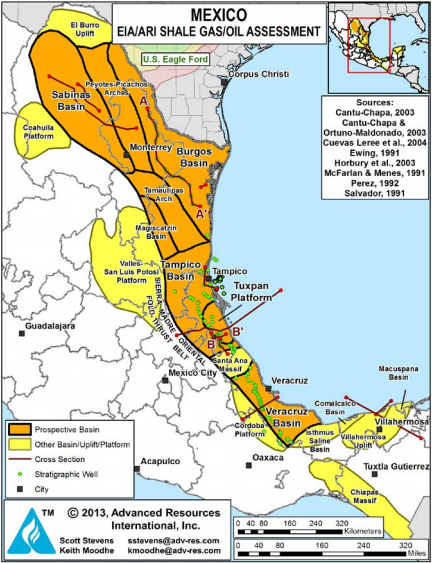 Prospective shale basins line eastern Mexico. Still, that’s a big “when.” In the meantime, Mexico’s shale aspirations face a wide array of other challenges. A lack of drilling innovation is only one roadblock to Mexico’s shale success. Operational pitfalls such as water scarcity, decrepit infrastructure, high costs, and organizational inefficiency are equally at fault. Cartel violence also plagues the nation, remaining a discouraging factor for businesses on the other side of the Rio Grande. Drillers are wary to risk their personnel and equipment in such an uncertain landscape. 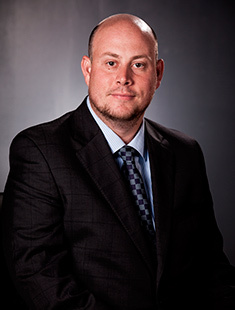 Government regulations themselves have also hindered tapping these shale resources. The Mexican energy sector was nationalized in 1938. With the establishment of Petróleos Mexicanos (“Pemex”), a state-run monopoly was formed and essentially ushered foreign investors out the door. But last August, Mexican President Enrique Peña Nieto signed into law a constitutional amendment to allow foreign investors access to the country’s assets for the first time in nearly 80 years. As a result of the new legislation, future Mexican energy production could see an increase of as much as 75% by 2040. Venezuela is typically considered South America’s oil producer – but soon its westerly neighbor could be joining the ranks. With an estimated 6.8 billion barrels of technically recoverable shale oil, Colombia has the third-largest unproved reserves in South America. 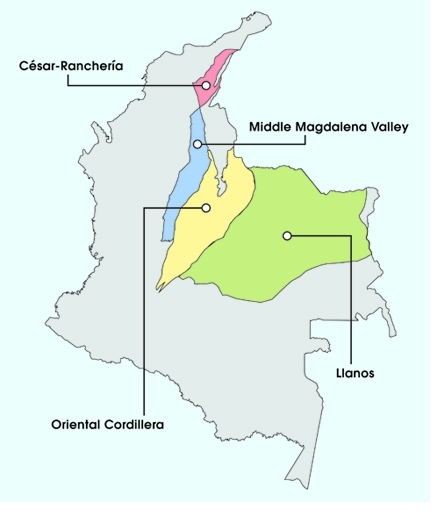 Colombian shale resources could exceed 6 billion barrels. As one of the oldest and most established conventional oil and gas industries across Latin America, Colombia’s oil and gas regulatory framework has historically been more supportive than its neighbors. And now many analysts view the country as Latin America’s most promising unconventional oil and gas opportunity, drawing expanded exploration, reservoir studies, and global investment. Leading the charge for Colombia’s shale development is state-run oil company Ecopetrol SA, which has a production target over the next few of years of around 800,000 barrels a day. And they’re not alone: Some big names in energy have jumped in feet-first. Canada’s Canacol Energy Ltd., a close second in total market share of prospective shale oil land holdings, is targeting the Magdalena Basin. Meanwhile, supermajors Royal Dutch Shell and Exxon Mobil Corp. continue to maintain their interest in shale projects – despite the slump in prices. Much of this E&P investing comes in the wake of newly established fracking regulations, finalized in September 2014. Production regulations will be published by year-end. In an effort to develop the nation’s resource, the regulations stipulate that unconventional resources pay a lower royalty rate to the government. Colombia envisions fracking as a part of their national endeavor to lower their carbon footprint. According to Mines and Energy Minister Tomas Gonzalez, the nation is optimistic that unconventional resources could eventually account for half of its gas reserves and a fourth of its oil reserves. But Colombia’s shale industry is still in its infancy. There’s no telling how environmental and fiscal regulations will evolve or what the limits will be to the plethora of investment opportunities. With sizable shale resources – in the neighborhood of 63 trillion cubic feet – India’s enormous population has created a growing demand for energy. Energy demand is expected to rise by 8% per year over the next decade. Coal currently supplies 75% of India’s energy – chiefly from imports that increased by 135 million tons in 2012-2013. India could be the beneficiary of sizable shale deposits. To change its energy landscape, the country recently cleared some major roadblocks to developing a shale extraction industry, intensifying domestic exploration and production activities and developing a shale gas policy framework. The New Exploration Licensing Policy (NELP) encourages both national oil companies and international interests, and has accelerated the pace of oil and gas exploration: So far, the government has awarded 254 blocks from private and foreign operators like Niko Resources and Oilex. In 2011, India-based multinational Oil and Natural Gas Corporation, Ltd., (ONGC) began testing shale gas flow at the surface in the Damodar Basin. Now the corporation is working alongside Oil India on plans for drilling in various basins to assess shale gas and oil potential across the country. But – once again! 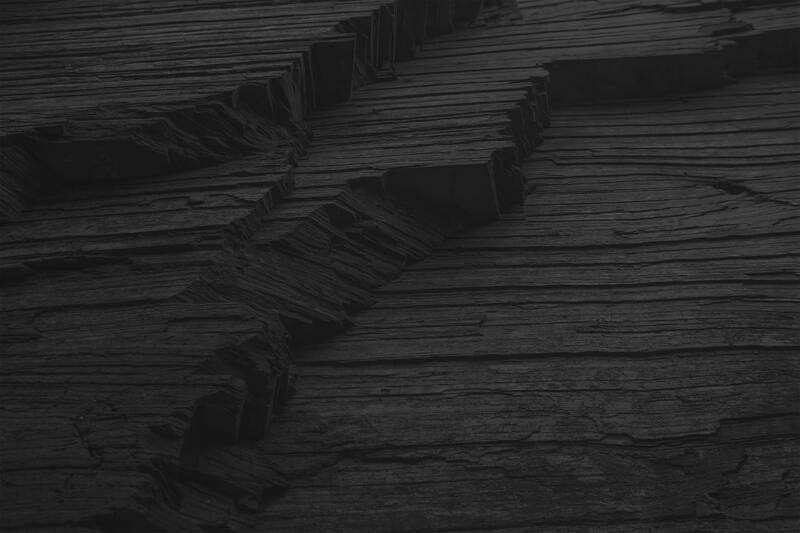 – geological obstacles abound. 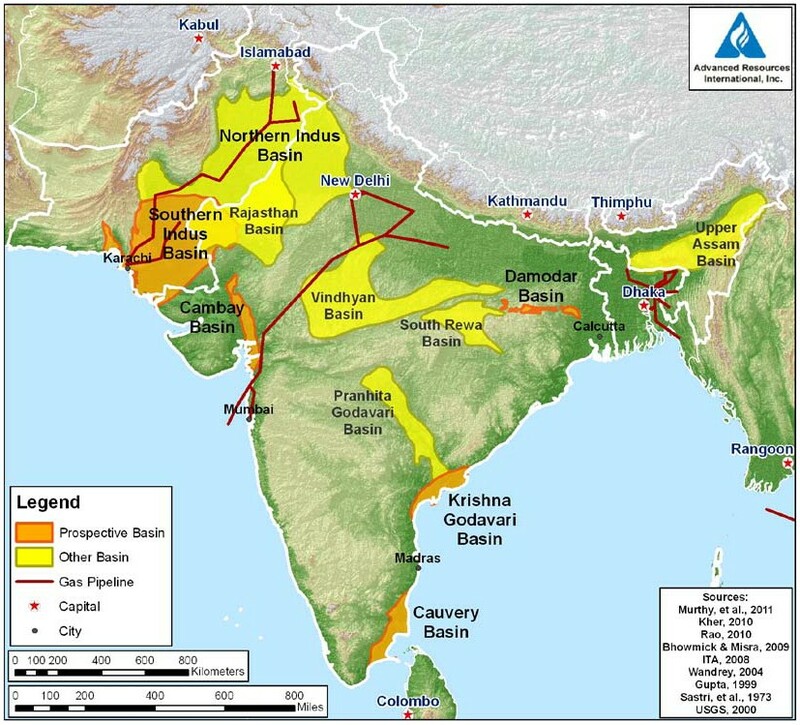 Although India has many shale-rich basins, industry insiders are only eying six for commercial potential: Cambay, Assam-Arakan, Gondwana, Krishna-Godavari, Kaveri, and the Indo-Gangetic plain. And India is water-poor. This worrying lack of water has ground the process to a halt before it even had a chance to take off. Fracking is a water-intensive process, and without a sufficient water supply, India’s shale industry will not be able to move forward. Tim Probert, a Halliburton strategic advisor, admits surprise that some of these foreign shale hotbeds have yet to emerge. He and other industry insiders have been expecting international fracking advancements for some time. But currently only about 100 rigs drilling in shales and other “tight” reservoirs are scattered around the world – compared to more than 1,000 in the US alone. And no matter where in the world the shale industry does expand, we can be sure that American entrepreneurship and technology will drive a good deal of those developments.